The First Sample From A Rock On Mars Isn't Red — It's White! A couple of weeks ago, NASA’s Curiosity rover used the drill on her robotic arm for the first time to drill into a Martian rock and collect a powered sample from the inside of that rock. The rock, called “John Klein,” was chosen because it was flat and stable for drilling. It also showed signs, like white veins, that water once flowed through it. The image above was released by NASA today and shows the powdered sample sitting in the rover’s scoop. This confirms that the drilling was successful. There’s about a tablespoon of material sitting in the scoop. The scoop is a little less than two inches wide. 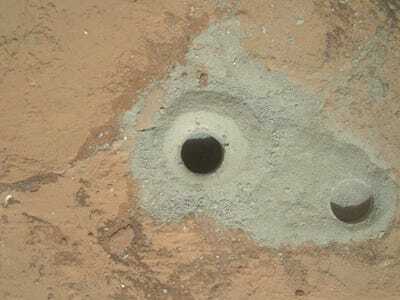 Here’s the first drilling hole on Mars in which a sample was collected. A shallower hole, used as test, sits to the right. What’s interesting is that the scoop sample has a white-ish, grey colour, not the typical orange-red colour that we associate with Mars. 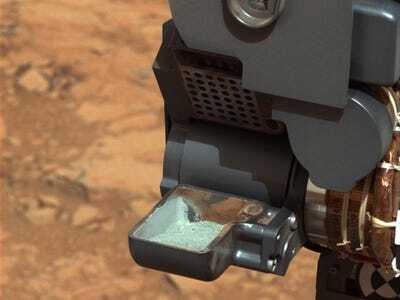 We’ve seen evidence of this before when the Curiosity used a wire-bristled tool to brush dust off a patch of rock. Everything is covered in red dust, but once underneath it’s actually more grey. “When things turn orange it’s because there is a rusting process that oxidizes iron in rock,” Joel Hurowitz, Curiosity’s sampling system scientist, said in a press conference Wednesday, Feb 20. Because these rocks are not orange it means that they may have not gone through this process. In turn, they may provide some indication of what iron was doing before the later oxidation process, explains Hurowitz. We’ll know more about the actual chemistry of the sample once Curiosity does some real analysis with her sophisticated set of tools. That’s the next step. The sample will be sieved and then portions of the sample will be passed straight to the Chemistry and Mineralogy instrument and then to the Sample Analysis at Mars instrument.